EAST GREENWICH, RI and NEW YORK, NY--(Marketwired - May 18, 2015) - Investorideas.com, a global investor news source covering leading topics and sectors including sports and entertainment, releases an exclusive follow-up interview with entrepreneurial award-winning movie producer, businessman and investor Chad A. Verdi, following the sale of 'Bleed for This' to Open Road Films at the Cannes film festival. Game-changing entrepreneur and producer Chad A. Verdi also talks about future film projects. Adding insight to the significance of the movie, actor and rising star Miles Teller from Whiplash and Insurgent tells Investor Ideas how it feels to be part of this inspirational movie. 'Bleed For This' is the true-life story of World Champion Boxer Vinny Pazienza who, after a near fatal car crash, made one of the most incredible comebacks in sports and boxing history. Open Road Films (http://www.openroadfilms.com) is a leading, independent, theatrical motion picture company, releasing a diverse slate of star-driven films which has included multiple #1 releases. It was founded in 2011 by AMC Entertainment Inc. (AMC) and Regal Entertainment Group (Regal), the two largest theatrical exhibition companies in the United States. Open Road and its lenders recently extended the company's $100,000,000 credit facility through 2018. 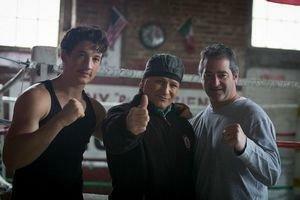 Sony Pictures Worldwide Acquisitions acquired the rights to multiple territories for Bleed For This including Germany, France, Spain, Benelux, Canada, Scandinavia, Australia, Latin America, Eastern Europe, Greece and South Africa. Chad, I understand domestic rights for your film 'Bleed For This' were sold at Cannes on a 12 minute sizzle real for over 4 million dollars to Open Road? You must be so happy and proud of this film and what you have done. Can you please walk us through how this project all came about? Yes, about 5 years ago when my wife Michelle and I acquired the rights to Vinny's life and brought in Noah Kraft, our only producing partner at the time, no one thought we were going to be able to pull this off. Selling this film at Cannes was a huge victory for the film and everyone involved. It's funny how things happen. I was friends with Vinny and told him if he was not successful selling his rights and getting a deal in place, Michelle and I would step in. When I received the call from Vinny that no deal was in place, it was game on. He has the best comeback story in sports history and all Michelle, Noah and I wanted to do was tell his story to the world. We attached writer-director Ben Younger, who is brilliant and wrote a great script, and then Senator Whitehouse from RI introduced me to Marty ("Martin Scorsese") and Emma Tillinger Koskoff and the rest was history. Emma, Michelle and I got involved with a film Michelle and I absolutely love called 'Bad Hurt' that Emma was producing with her husband Nick Koskoff. Michelle and I then executive produced a documentary that Marty directed called 'The 50 Year Argument' (that's playing now on HBO) and that lead to the two of them signing up to 'Bleed For This'. Then Bruce Cohen came on board along with Pam Thur as producers. My friend Joshua Sason from Magna entertainment financed the film and joined the team as an exec-producer. I believe the team assembled is one of the best all-around producing teams put together in a long, long time. This is a huge deal. A worldwide release to over 1000 screens, with all major oversee territories are now sold. Did you ever envision this in the beginning? Yes, it is a huge deal for the film and yes, I always thought we would be successful with this project. What I did not expect was the quality of people that we were able to bring in. Even Ben Younger, my writer and director said to Noah and me early on, that he never thought we were going to be able to attach Marty and Emma in the manner that we did. When that happened, everything fell into place quickly. Also, it's not common to have the two biggest agencies representing your film. This sale does not happen without WME's Mark Ankner and CAA's Micah Green These guys worked their butts off to get this film sold. The Solution group handled all overseas sales and killed it -- they sold everything. What did you think of the performances of your actors in this inspirational film? Miles Teller killed it! I love the kid and he should win the Oscar and same goes for Aaron (Eckhart). He is the real deal. Ben Younger did a great job casting this entire film. The acting in this film from top to bottom is simply fantastic. I have to ask, there is a rumor that you are getting involved with a project called 'The Great White Hope', another boxing project about Tommy Morrison. Is this correct? Well it's not a rumor anymore, is it? Yes, I am in the beginning stages of developing that project but you won't be seeing that hit the big screens for a while. I am thinking 2020. What got me thinking about this project was the fact that I own his heavyweight championship belt; the one he earned after he beat George Foreman. Tommy died recently and many people believe he died of AIDS. I am not sure that is the case. This film will tell the truth about his life. That being said, right now Michelle and I have six films coming out over the next 18 months and we want to enjoy every minute of the journey. 'Almost Mercy' is being released this month and this film was written and director by Tom DeNucci, a dear friend of ours. Then 'Ten Thousand Saints' starring Ethan Hawke, Hailee Steinfeld and Emile Hirsch will hit theaters this summer. We expect 'War Pigs' starring Mickey Rourke and Dolph Lundgren to be released in theaters in early October with 'Bad Hurt' to follow. 'Bleed For This', as you know, starring Miles Teller and Aaron Eckhart, was just sold to Open Road and they will decide that release date. And then 'Silence' that features Andrew Garfield, Liam Neeson, Adam Driver and Ciarán Hinds is being released in 2016. We are doing an Interview now with producer Chad A. Verdi, can u give a quote and answer the below questions please. How was filming in Rhode Island and working with producers Chad and Michelle Verdi? Being able to shoot the movie in the same areas the story is based on was the best possible scenario. Vinny is such a historical figure to the city of Providence and represented the blue collar working class people, and was a true warrior in the ring. When Vinny was making his comeback the entire city rallied behind him and was a big reason why he always wanted to fight in his home state because he was undefeated in front of his home crowd. When we would be filming on the streets and people were saying "Go get em Paz! ", "We love you Paz!" I would get goose-bumps it felt so real and authentic. This has been a long time passion project for Chad and Michelle and I know how hard it was for this movie to get made. I was truly honored to be chosen to play this part and i will forever be thankful to Chad and Michelle and the rest of the Bleed For This team for giving me this beautiful story to tell. How excited are you about the Open Road deal that took place in Cannes? I'm very excited to be working with Open Roads. They are a tremendously strong company to have behind us and the fact they went after the film so aggressively based on just a small sample of the film says a lot about their ambitions for the film. I thought they did a wonderful job with Nightcrawler last year and with this film and Dope they've made it clear their intentions to solidify themselves as serious dramatic contenders. Thanks Chad, as always you have more on the go than anyone could imagine. Good luck with the journey. Thanks Miles, you are on the watch list for movie fans as the next great star.